Margaret River is a town in the South West of Western Australia, located in the valley of the eponymous Margaret River, 277 kilometres (172 mi) south of Perth, the state capital. Its Local Government Area is the Shire of Augusta-Margaret River. Margaret River’s coast to the west of the town is a renowned surfing location, with worldwide fame for its surf breaks including, but not limited to, Main Break, The Box, and Rivadog. Colloquially, the area is referred to as Margs, or Margie Rivs. The surrounding area is the Margaret River Wine Region and is known for its wine production and tourism, attracting an estimated 500,000 visitors annually. In earlier days the area was better known for hardwood timber and agricultural production. Margaret River is located 9 kilometres (6 mi) inland from the Indian Ocean at a point about halfway between Cape Naturaliste and Cape Leeuwin in Western Australia’s South West region. Several hundred caves are located near Margaret River, all of them within Leeuwin-Naturaliste National Park. Six of these are open to the public. One of which being the multi-chambered Mammoth Cave, which lies 21 kilometres (13 mi) south of the town and contains fossils dating back over 35,000 years. The cave was first discovered by European settlers in 1850 and has been open to the public since 1904. The cave can be explored by a self-guided audio tour, and is one of the few caves in Australia offering partial disabled access. Margaret River is the foremost Geographical Indication wine region in the South West Australia Zone, with nearly 55 square kilometres (21 sq mi) under vine and over 138 wineries as at 2008. Dunsborough is a coastal town in the South West of Western Australia, 254 kilometres (158 mi) south of Perth on the shores of Geographe Bay. Dunsborough is a popular tourist destination for Western Australians; in 1999 it was voted the state’s best tourist destination and in 2013 awarded the Top Tourism Award for Population Under 5,000. The town’s location in Margaret River Wine Region provides easy access to many wineries and breweries. The town is a favoured destination for annual school leavers in WA, the other frequent choice being Rottnest Island. Located on the stunning turquoise banks of Geographe Bay, Dunsborough would have to have one of the most tranquil and magnificent locations in the world. 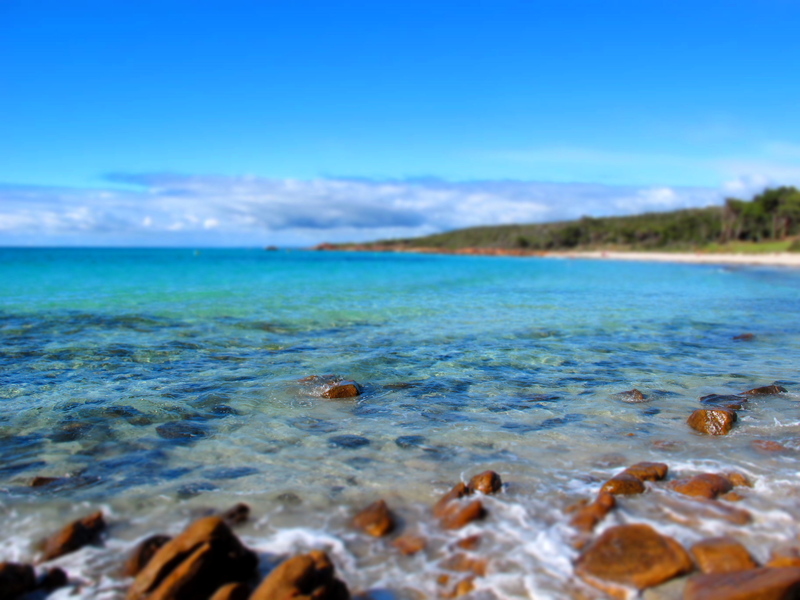 Sparkling calm clear water and white sandy Dunsborough beaches are linked to town by lush green grass and shady paths. There is a bustling café atmosphere and plenty of gorgeous boutique shops. At night there’s a great vibe with brew houses, wine bars and pubs with a live music scene, restaurants and cafes. Beachfront cycle ways and walking paths turn into a hiking trail through the regional park along the bay. With ideal beaches for swimming it is also a great location for diving, snorkelling, kayaking and other water sports. There are even two golf courses! Out on the most north-western point is the top end of the Leeuwin-Naturaliste National Park, which is one of the many Dunsborough attractions. This precinct is home to Dunsborough’s working lighthouse, Cape Naturaliste and the starting point of the Cape to Cape Track. Built on the foundation of surfing and family holidays, this resort town has grown into a holiday spot rich in luxury and fun, ideal for family, friends, couples and backpackers. The life of the city is fuelled by the 1.8 kilometre long Busselton Jetty and the amazing waterfront precinct which has developed around it. With the jetty as a focal point, the waterfront is brimming with activity. Seaside cafes, kiosks, bars and restaurants give way to bike paths, large shady grassed areas and a calm tranquil white sandy beach. Take a walk or train ride to the end of the Busselton Jetty, which is one of the main Busselton attractions, to the Underwater Observatory where you can see amazing marine life. The bustling main street has a cosmopolitan atmosphere with superb alfresco restaurants, cafes and pubs and boutique shops. The allure doesn’t stop there with an events calendar bursting with sporting and cultural events. Culture vultures can visit the Busselton Museum, the Old Courthouse Art Complex or St Mary’s Church – with countless other attractions like caves, historic lighthouses, wineries, craft breweries, art galleries, restaurants, pubs, beaches and scenic viewpoints just around the corner. Running south from the Jetty is Queen Street. A two minute walk along this thoroughfare will have you at the ArtGeo Cultural Complex, offering a fusion of art, culture and heritage. Continue along for another two minutes and you will be in the heart of the CBD. The City center itself offers all the conveniences you might need including major supermarkets, banks, pharmacists, travel agents and more. Make time to stroll through iconic Fig Tree Lane between Prince and Kent Streets for a bit of retail therapy or watch the world go by at one of the funky small bars or cafes. The region has a Mediterranean style climate, with pleasant summer months and mild winter rainfall. Bordered by the Indian and Southern oceans, the region’s coastline features some of the best surfing beaches in the country, towering forests and established wine regions. Australind is located 156 km south of Perth via State Route 2 and only 12 km north of Bunbury via the Old Coast Road. Australind is part of one of the fastest growing regions in Western Australia. Although now effectively a suburb of Bunbury, it is a significant historic town and a popular place for people seeking something quieter than the bustle of Perth and yet still wanting easy access to the city. A classic ‘seachange’ destination. It is claimed that St Nicholas Church in Paris Road is the smallest church in Australia. Certainly it is the smallest in Western Australia. It is only 3.8 m wide and 6.7 m long and was originally built in 1848 as a workman’s cottage. The timber used was jarrah. Services are still held in the church. Located on the corner of Old Coast Road and Upton Place, Upton House, an elegant two storey dwelling which was built in 1847 for Marshall Walter Clifton, features french windows, a wide verandah and casement windows. The house was shipped out from England but by the time it was constructed most of the settlers had departed. IIt is now a private residence and not open for inspection. Located at the northern end of Australind, the Leschenault Peninsula is a rich destination for native flora and fauna. It is possible to see kangaroos at dusk; dolphins and flocks of birds (60 species have been sighted) including black swans. There are a number of excellent nature trails and tracks including the Australind Heritage Trail, Australind Jetty Walk, Herron Walk Trail, Wetland Wonders Trail, Belvidere Estuary Walk, John Boyle O’Reilly Wetland Trail and the Harris Track. Clifton is a small, mostly uninhabited, locality located in the Peel region of Western Australia between Mandurah and Bunbury. Adjoining the nearby suburb of Herron. It lies on a narrow strip between Lake Clifton and Yalgorup National Park to the east, and the Indian Ocean to the west. The area, originally known as “Koolijerrenup” by the local Noongar people, was named in honour of Marshall Walter Clifton, Chief Commissioner of the Western Australian Company’s settlement at Australind and later a member of the Legislative Council. The Yalgorup National Park was established in the 1970s to protect the coastal lakes, swamps and tuart woodland in the area. The area is also central to waterbird migration patterns. 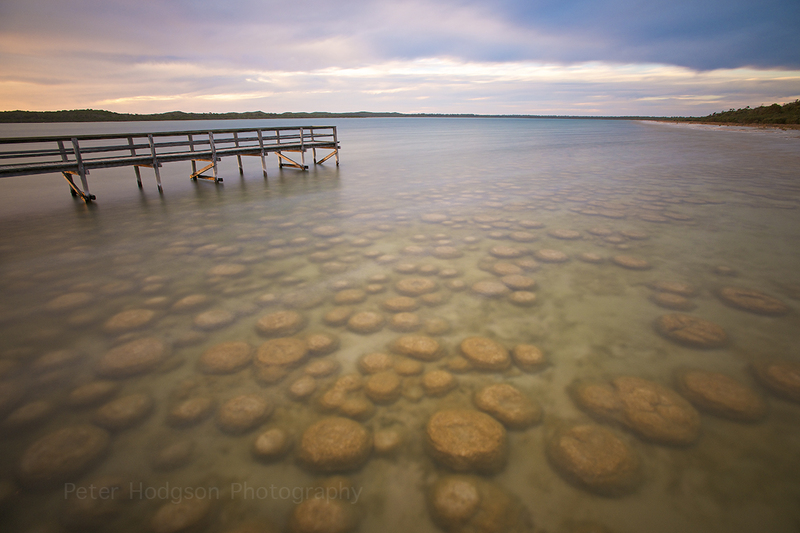 At the edge of Lake Clifton, rock-like structures called thrombolites (similar to stromatolites) can be seen, built by tiny micro-organisms believed to resemble the earliest forms of life on Earth. Scientists have suggested their presence here may be due to upwellings of fresh groundwater high in calcium carbonate. An observation walkway has been constructed to allow visitors to view these fragile structures. An action has been started to list Lake Clifton as a World Heritage Site by the French artists “Art Orienté objet” in 2011. Bunbury is a coastal city in Western Australia, situated approximately 175 kilometres (109 mi) south of the state capital, Perth. It is the state’s third-largest city, with a population just behind that of Mandurah. Located at the south of the Leschenault Estuary, Bunbury was established in 1836 on the orders of Governor James Stirling, and named in honour of its founder, Lieutenant (at the time) Henry Bunbury. A port was constructed on the existing natural harbour soon after, and eventually became the main port for the wider South West region. Further economic growth was fuelled by completion of the South Western Railway in 1893, which linked Bunbury with Perth. Greater Bunbury includes four local government areas (the City of Bunbury and the shires of Capel, Dardanup, and Harvey), and extends between Yarloop in the north, Boyanup to the south and Capel to the southwest. The economy of Bunbury is diverse, reflecting the range of heavy and general industries in the locality, mining, agricultural landscapes, services for the growing population, key transport links and the influence of Perth. The mining and mineral processing sector remains the main economic driver for Bunbury. Other industries that are vital to the economic well-being of Greater Bunbury include retail and service industries, building industry, timber production and tourism. The Bunbury Port will continue to be the centre of economic activity for the Greater Bunbury sub-region with the flow of goods through it to and from all parts of the world. The proposed expansion of the port, as identified in the Bunbury Port Inner Harbour Structure Plan, will promote further economic growth for the sub-region, and may in time be an economic stimulus for the corporate support and ancillary services associated with port-based industries locating to Bunbury city centre, further strengthening its role as a regional city. Waroona is a town located in the Peel region of Western Australia along the South Western Highway, between Pinjarra and Harvey. The town is the seat of the Shire of Waroona. The Shire of Waroona likes to describe itself as stretching from ‘sea to scarp’ – from the Indian Ocean to the Darling Range. This actually makes sense because the small town, known primarily for servicing the surrounding beef, dairy farming and forestry communities, is rather inconsequential when measured against the beauty of Preston Beach and the remarkable thrombolities on the shores of Lake Clifton. The district, because of its proximity to Perth, has become a popular weekend retreat and is noted for the water skiing on the Waroona Dam, trout and marron (fresh water crayfish) fishing, swimming and bushwalking. There are a series of rather artistic bollards around Waroona. These form the local heritage trail. A unique, and decidedly modern, variation is that the commentary can be accessed by scanning the bar code on the bollard with your mobile phone. For those who like to read, there is a suitable caption on the top of the bollard. Thus, outside the town’s Memorial Hall Bollard No. 7 reads: “The Irrigation Office was built in 1939 to house government employees. The cafe was built in the 1930s and originally known as the Star Cafe. Built in 1932, the Memorial Hall replaced the original weatherboard hall.” There is a trail guide available from the Visitor Centre.